new and traditional ways to participate in their child’s daily learning, at each stage right from birth. way parents can help babies regulate their muscle tone, both up and down, as suits the situation. kneeling. They need to be free to use their arms so that they can hold a toy and play in many different positions. that can stand, walk, run, jump rope and play with a ball. 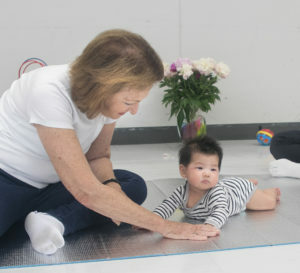 In order to build a foundation for new learning, a Child’Space session always begins with activities around starts a process of playful self what the baby already knows how to do. This establishes trust and exploration. For a baby, learning transitions between positions is as important as being stable in one position such as sitting. Mastering transitions give babies the ability to choose their environment and to direct their own learning. babies encounter as they grow. the vocabulary of activities that belong to the human developmental program.